Moth InfestationIt seems that overnight our kitchen has been infested with bugs! Most of them are potato bugs and little tiny tan colored moths. They fly around everywhere and leave their egg sacks and larvae in all our crevices! How can we get rid of them? 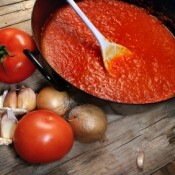 Tomato Sauce RecipesThis is a guide about making spaghetti sauce using fresh tomatoes from your garden. Included are recipes and tips for making tomato sauce from fresh tomatoes. Inexpensive CenterpiecesI have just been called upon to make centerpieces for a up and coming church banquet. I need to make fifteen centerpieces and they have to all be under five dollars each! We are going with a fall motif.